We’re so lucky at Ayr to be the only campsite actually in St Ives – which means you can be in the town or on the beach in minutes, without having to worry about parking. Located on the beautiful clifftops above St Ives Bay, it’s a short stroll down into the centre of town. Here’s a brief introduction to our lovely local town. It’s around a ten-minute walk into St Ives from Ayr Holiday Park. St Ives has a small working harbour (where you can pick up a boat trip) and pretty winding streets to explore. 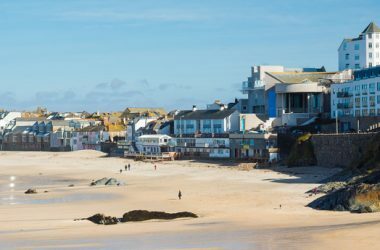 Visit the famous Tate St Ives and the fascinating Barbara Hepworth Museum and Sculpture Garden, or simply enjoy meandering though our welcoming town. 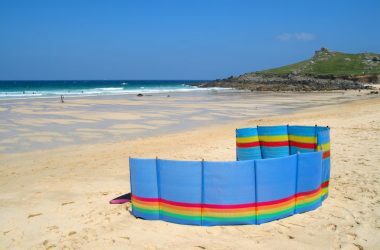 We’re not exaggerating when we say that St Ives has some of the country’s best beaches! The closest beach to Ayr (and the one you can see from the holiday park) is lovely Porthmeor, with its long, golden sweep of sand. On the other side of town, Porthminster Beach is also stunning, and there are several smaller beaches in between them. Which will become your favourite? You can get straight onto the famous South West Coast Path from the campsite. Head west from Ayr along one of the most beautiful sections of the 630-mile pathway. 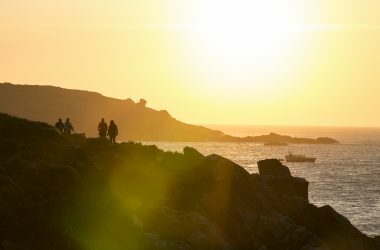 Walk to Zennor village with its lovely old church and pub, and take the cross country path back to your pitch for an enjoyable circular walk. It’s a short stroll down the hill to the Royal Cinema, and you may catch a production by excellent local youth theatre group, Kidz R Us. 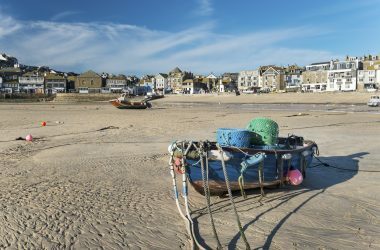 There are plenty of bars and restaurants in town, and on a warm evening, St Ives takes on a distinctly Mediterranean air. Or, you may prefer to relax onsite, enjoying the beautiful views, or simply pop next door for a meal or drink at The Garrack Hotel. Ayr Holiday Park is in a great location for West Cornwall’s other attractions. You’re only a short drive away from St Michael’s Mount, the clifftop Minack Theatre, and other picturesque little towns like Mousehole. 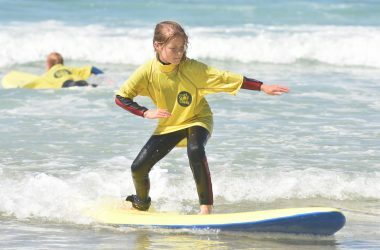 The A30 is easily reached from the holiday park, and it’s a straightforward journey up to the Eden Project, the family-friendly attractions of Newquay, and lively Falmouth and Truro. If you want to leave your car behind at Ayr, there is a branch line station in St Ives. Take the connection to mainline St Erth if you’d like to explore Cornwall by rail. The bus depot is next to the station – look out for the open-top service during the summer – as well as a taxi company. St Ives has many excellent specialist shops and delis for fantastic local food. There’s also a Tesco in nearby Carbis Bay, an Asda in Hayle, and Sainsbury’s and Morrisons in Penzance. The Penzance supermarkets also have petrol stations. The Stennack surgery is just down the road from Ayr Holiday Park, and there is a hospital in Penzance. The county hospital, The Royal Cornwall, is around 20 miles away this side of Truro. For four-footed campers, there’s a veterinary surgery within walking distance.